As a mom I always try to give my boys healthy, all-natural foods. In the past I always felt like organic / all natural food options for kids were limited. Especially in the baby food and toddler food departments. The organic baby selection at the grocery store was pretty small with only one brand to choose from and only a few flavors. For toddler and preschool aged foods, well there really weren't any organic options. So when I read about Plum Organics and Revolution Foods on another blog, I knew we had to try their food! Plum Organics and Revolution Foods are sister companies that are under the parent company of Nest Collective. Nest is a place to hatch world-changing ideas, grow mission driven companies, and nurture a new way of doing business that embraces the best of what nature and people have to offer. Nest is a collective of companies and people out to make the world a little better, twig by twig. Plum Organics offers a variety of organic baby food and organic snacks for tots. There are two lines of baby food: the just line and fruit & veggie blends. The just line is yum 1 stage (4-6 months) baby food fruit purees and are made from 100% organic fruit. There are 6 fruits available: apples, mangos, bananas, peaches, pears and prunes. The fruit & veggie blends are the yum 2 stage for 6 months and up. These are available in a variety of combination including pear & mango and apple & carrot. All of the baby food purees come in portable, resealable, BPA-free packaging and have no added sugars, colors or flavors. My baby is too young for baby food so obviously we didn't try any of these but I am anxious to try some once he is 6 months old. 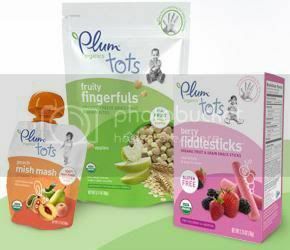 For tots Plum Organics has three organic snack options: mish mash fruit purees, fiddlsticks gluten-free fruit & grain sticks and fruity fingerfuls fruit & grain bites. Once again everything comes in BPA-free packaging. I had received a package of the fruity fingerfuls in apple to try out. This is kind of like two snacks in one pouch since you have freeze dried fruit and and heart shaped whole grain, which is kind of like cereal. My 2.5 year old Luke loved these. I poured a generous amount on his plate and a minute later he was handing the plate back to me asking for more. The fiddlesticks look yummy as well and I really think my twins would enjoy them because they are different looking and fun. I have yet to find them in a store so I am going to have to order some online. 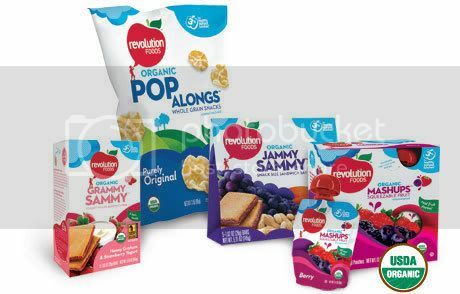 Now Revolution Foods makes organic lunch box snacks for older children, I'd say preschool aged and up. What is great about all of their snack items is there are never any transfats, high fructose corn syrup or artificial ingredients. We received one Jammy Sammy, two Grammy Sammy and two Mashups to taste, one for each of my older boys. William (5) had the Cocoa Graham & Banana Yogurt Grammy Sammy, Joshua (2.5) had the Honey Graham & Strawberry Yogurt Grammy Sammy and Luke (2.5) had the Peanut Butter & Strawberry Jammy Sammy. Each one of them INHALED their Sammy. In fact when I first opened the box of samples, they practically attacked me to try these. They literally ate them within 5 minutes of the package arriving at our house. they LOVED them. Revolution Foods had also given me one coupon for a $1 off so I went to Babies R Us 2 days later to buy more. Not only are these good for lunch boxes, but also good for snacks on the go in the car or when out and about. I now always have a box on hand of the Peanut Butter & Strawberry Jammy Sammy and I toss it my diaper bag when we visit family ust in case my stubborn boys don't like what is on the menu. If they don't want to eat whatever our host is providing, at least I have these healthy Sammys as a backup. Revolution Foods also has an In-School Lunch Program which delivers healthy meals and nutrition education to schools across the country. 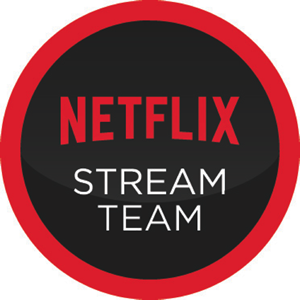 They currentlty are working with schools in Northern and Southern California, Colorado, and Washington DC. Some of the highlights that I really like about these meals are: the meals are prepared fresh daily and are fried, overly processed, or microwave; they do not contain high fructose corn syrup or trans fats; they are free of artificial preservatives, colors, flavors, and sweeteners. Most schools today serve highly processed junk, including the schools in my town. When I am done writing this I need to ask Revolution Foods if they plan on expanding this program to New England. 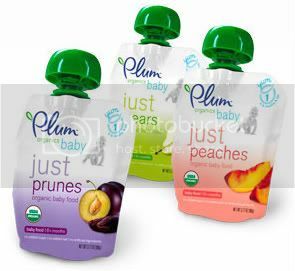 Plum Organics and Revolution Foods are available in several stores such as Whole Foods, Babies R Us, Toys R Us and H-E-B. They can also be purchased online at BabiesRUs.com, Amazon.com, Diapers.com and Drugstore.com. One (1) winner will receive a selection of snacks from both Plum Organics and Revolution foods with snacks for your baby, toddler and kids! The prize includes a kids t-shirt, a reusable lunchbox filled with some samples from the Plum Organics baby & toddler line, a reusable lunchbox with samples of Revolution Foods organic kids snacks and a secret snack selector (fortune tellers). Visit Plum Organics and Revolution Foods then tell me which products you think your kids will love. - Take the "Generation Organic Pledge" and display the badge on your website or blog. You must use a valid email when you take the pledge and leave me a link so I can see your badge on your site. Worth 2 entries so leave 2 comments. - Become a fan of Plum Organics and Revolution Foods on Facebook. This giveaway is open to US Residents 18+ only and will end on Friday, March 26 at 11:59pm EST. One winner will be chosen at random using Random.org and will be posted on the Winner's Announcement Page. Winner has 48 hours to claim his/her prize otherwise a new winner will be picked. You must leave your e-mail address in all of your comment(s) so I can contact you. I will not share your e-mail address with anyone, it will strictly be used to notify you if you win. Good luck! Please note that the opinions and views expressed in this review are my own and based on my personal experience with the product. You may encounter a different experience with this than I did. Nest Collective, Plum Organics and Revolution Foods provided me with samples for review and is providing the items for the giveaway. My three year old and 1 year old would love the fiddlsticks! I'll have to look for these around my home. I'm a fan of Plum Organics on Facebook. My family is a huge fan of this entire product line. I have a 3 year old and 16 month old and we use the fiddlesticks (bought at babies r us) the fruit mash and the grammys. I have not tried the ones with peanuts as we have not introduced this food group yet due to allergies. My kids love the fruit mash chilled as a special treat! I would love to be entered into this giveaway! I visited the Plum Organics website. I believe my 6 month old will love the Pear & Mango! I can't wait for him to try it! Second entry for Generation Organic Pledge! My daughter loves mango, so I know she'll love the mango fruit puree from Plum Organics. I would love for her to try the grape mashups from Revolution Foods because she's still too young to eat grapes whole! I am following this blog on Google! I became a fan on Facebook, and Shared your blog on my homepage. My daughter loves the peaches and the fiddlesticks! We love Plum Tots!! I am a fan of Plum Organics of Facebook! I think my daughters would like the Cheesy Cheese Pop Alongs. Thanks for the review and giveaway! I a fan of Plum Organics-- my son loves the just pears and Plum the tropical flavor of Revolution Foods -- he ate it today! My son would just love the Yum 2 apple, apricot, & banana purée in Plum Organics and Mashups berry flavor in Revolution Foods. My kids would love the Purple Original Organic PopAlongs and the Berry Fiddlesticks! The peach is too good. I love the fruit mashes. They are great for the boys to take to school for snack time. My son would love the fiddlestick products from Plum Organics! My son would love the Popalongs and Raisins from Revolution Foods. I am a fan of Green Mama on Facebook (Jessica Kirby). I am a fan of Revolution Foods on Facebook (Jessica Kirby). I am a fan of Plum Organics on Facebook (Jessica Kirby). I have added Green Mama's Pad to my blog roll! Unemployed_Mom now follows @GreenMamasPad, @PlumOrganics and @RevolutionFoods on Twitter. I also retweeted the giveaway. The Banana Fiddlesticks and the Grammy Sammys sound so yummy! Thank you. I think the Plum blueberry, pear & purple carrot baby food sounds great! We love raisins in this house so I would like to try the organic raisins. My son would love the berry fiddlesticks and the organic mashups. My daughter loves the mish mash and I think she'd really like the fiddlesticks and jammy sammy next. Became a fan of Plum Organics and Revolution Foods on Facebook! My daughter loves Jammy Sammy's! My son would love the jammie sammies!! I think my granddaughter would like the Cheesy cheese pop alongs. My 1 and 3 year olds would like the berry fiddlesticks and my older girls would like the Jammy Sammies. I think they'd like the Berry Fiddlesticks and the Simply Cinnamon Popalongs. Thanks. Cheesy Cheese Pop Alongs look great! I came upon your site from Ecobunga. My kids would love the Mashups and the Fiddlesticks! I want to see if my two year old and one year old will love the Fiddlesticks, which could hopefully replace those fake fruit snacks they are so fond of! My daughter would love the organic mashups. My children love the Mash Ups! My daughter would love the mashups! My daughter would enjoy the Simply Cinnamon Pop Alongs. I think my kids would like the cheesy cheese popalongs. Grammy Sammy and Popalongs sound good. I think that the Cheesy Cheese Pop Alongs would be a huge hit. Mango Fruit Puree and Popalongs and Raisins! I think my daughter would love the plum tots strawberry mishmash, and the revolution foods vanilla yogurt grammy sammy! fan of Plum Organics and Revolution Foods on Facebook. I think the berry fiddlesticks & the Cinnamon PopAlongs sound great! i follow @dickssportcmo on twitter - js22222222 . i follow @GreenMamasPad, @PlumOrganics and @RevolutionFoods on twitter - js22222222 . My daughter would love the MishMash snack and organic rasins! I like the Grammy Sammys. I would choose the Peach Mish Mash. I became a fan of Plum Organics and Revolution Foods on Facebook.